Intel recently announced its 8th gen Core CPUs for laptops and desktops, which were highlighted in new launches at IFA 2017. 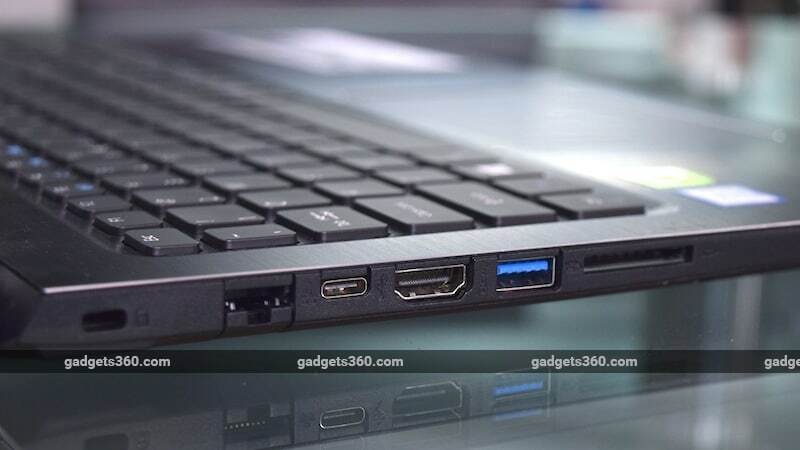 Laptops based on these new CPUs have already started trickling into the market, and Acer is one of the first companies to start selling them in India. 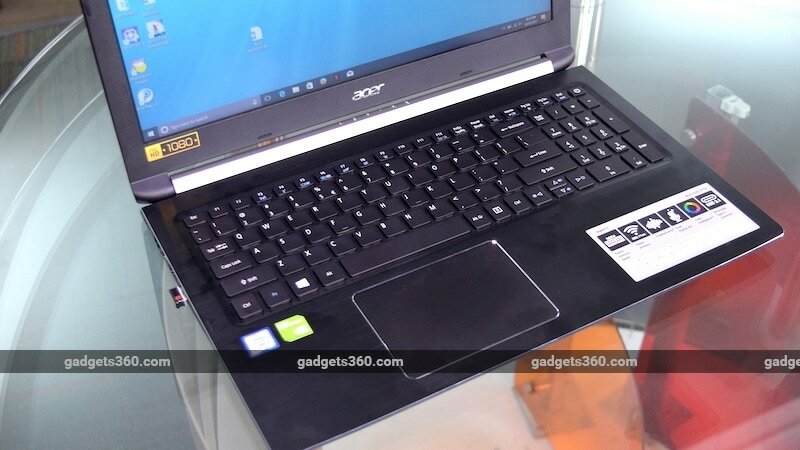 The Aspire 5 series has gotten the refresh, and Acer has launched multiple SKUs with slight variations in terms of specifications, all priced aggressively at around Rs. 50,000. The model on test today is the Aspire 5 A515-515G-571Z, which has the best configuration of the lot. Along with Intel’s new CPU, the laptop also boasts of Nvidia’s new budget-minded MX150 GPU, which makes this a very interesting multimedia solution at this price. Let’s see what you get for you money. The Aspire 5 is designed keeping a mid-range budget in mind, so most of the body is made of plastic. The lower half, where all the components go, is well constructed and feels sturdy. The Aspire 5 is also quite slim for a 15.6-inch laptop, measuring around 20.95mm thick. On the other hand, it’s still heavy at 2.2kg, so you will feel the heft in your backpack. The lid has a striped design, which looks nice and doesn’t attract fingerprints. However, it flexes quite easily and it doesn’t offer much protection for the display, which can easily warp when you press the lid. There is also noticeable warping on the left side of the display every time you open or close the lid. Acer has fitted a full-HD display on this particular variant (but not on all), so text, menus and everything in general looks sharp and clear. The lid can also tilt all the way back, to 180 degrees. The torsion of the hinge is good too so you can use it at multiple angles without worrying. Colour reproduction is decent, but the worst part is the viewing angles, which are quite weak. Horizontal viewing angles are not that bad but there’s a very narrow sweet spot for the vertical angles. The Aspire 5 has a good selection of ports. You get a total of three full-sized USB ports (two 2.0 ports, one 3.0 port), a Type-C port (USB 3.1, Gen1), Ethernet, HDMI, an SD card slot, and a headphone and microphone combo socket. 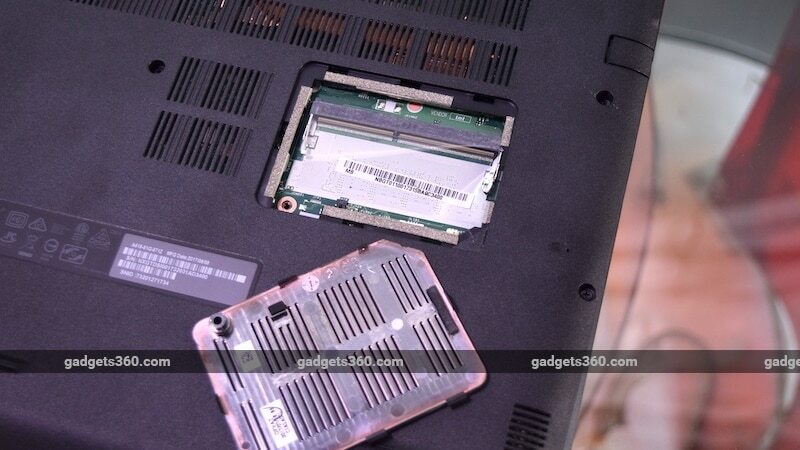 The laptop has a metal plate for the palm rest area, which gives it slight premium feeling. This also means there isn't any flex around the keys, which is usually the case with plastic. You get a backlit, full-sized keyboard along with a number pad. The keys are well spaced out and are comfortable for typing. We also found the trackpad to be generously proportioned. On the bottom of the laptop, we have a a lot of vents to maintain good air circulation. There are also two hatches for accessing the hard drive and RAM. This is very useful as it lets owners easily access these components without needing to go to a service centre. The laptop ships with a 60W power adapter and user manuals. Design is probably not the strongest suit of the Aspire 5 but its specifications are what’s really interesting here. It sports Intel’s new Core i5-8250U CPU, based on the Kaby Lake Refresh architecture. It still uses the same 14nm fabrication process but the number of cores has doubled from two to four, so you now get eight processing threads. This by itself should provide a sizeable boost in performance. There’s also 4GB of DDR4 RAM and a 1TB hard drive. You can add more RAM thanks to the empty accessible slot. Graphics are handled either by the CPU's integrated Intel UHD Graphics 620 GPU or the discrete Nvidia GeForce MX150. The latter component was recently announced by Nvidia, and replaces the ageing GeForce 940MX. It’s based on the newer 14nm Pascal graphics architecture and should significantly improve performance even though the CUDA core count remains the same. It supports DirectX 12 and has 2GB of GDDR5 memory to itself. Other specifications includes Bluetooth 4, dual-band Wi-Fi ac, and an HD webcam. The laptop ships with Windows 10 Home and you also get the full version of Microsoft’s Home and Student 2016 edition with this particular variant. There’s also a 30-day subscription to Norton Security. Other than this, you get Acer’s standard suite of bundled software like Acer Collection, which curates apps from the Windows Store; Care Centre which helps you keep your drivers up to date; Quick Access which lets you toggle the blue light filter; and Portal to help you set up your own private cloud. There are plenty of other apps from the Windows Store that ship with the laptop too, but you can uninstall pretty much all of them if not needed. The Aspire 5 has a good set of specifications but it’s hard to tell with regular use. Booting is slow and Windows 10 runs very sluggishly. Even opening various menus in Windows requires a bit of a wait. With apps like the Chrome browser running, you’re left with barely 1GB of free RAM, which causes a lot of lag. 8GB of RAM would have been a much better idea. Sadly, all the variants that Acer offers with 8GB have something else missing, such as Windows or the full-HD screen. At least you can add more RAM yourself. The Aspire 5 performs well in benchmarks, and in some multi-threaded tests, it manages to outperform Intel’s higher-end 7th gen CPUs. POVRay completed in 4 minutes and 2 seconds, while we got 3044 and 3578 points in PCMark 8, which are good scores for an i5 U-series CPU. The hard drive also performed well in SiSoft Sandra’s physical disk tests, where we got a drive score of 200MB/s. The Aspire 5 does a decent job when gaming at the native resolution if you drop graphics settings down to either Low or Medium for playable framerates, depending on the game. In Rise of the Tomb Raider, we averaged just 15fps with Medium settings, at 1080p using the built-in benchmark. Actual gameplay was better as the game hovered around the 20fps mark. In 3DMark Firestrike, we got a score of 3238 points. When gaming, the exhaust fan is audible and keys around the WSAD area tend to get a bit warm. The noise from the fan isn’t too distracting if you're on your own. The MX150 also supports Nvidia’s Optimus technology, which means it powers off when not in use. The Aspire 5 easily handles 4K video without any trouble. Acer also has a dynamic contrast adjustment system called Colour Intelligence, which is useful for animated movies but otherwise is best left switched off. The keyboard has good travel for typing and the keys aren’t too noisy. We like how the trackpad is generously proportioned, and button presses don’t require too much effort. The stereo speakers are placed on either side, on the bottom. They get fairly loud at full volume and sound best when the laptop is placed on a solid surface so that sound can reflect off it. The webcam also supports 720p video and picture quality is quite clear even indoors. Acer promises up to seven hours of battery life from the 4-cell battery but we managed to get about five-and-a-half to six hours, which is about average. We wish the display had better viewing angles, and we would have liked a sturdier lid. The default 4GB of RAM and mechanical hard drive really cripple Windows performance, so if you’re planning on getting this one, then it’s advisable to invest in another stick of RAM. product The Acer Aspire 5 is a mid-range multimedia laptop that boasts of Intel's latest 8th gen CPU and Nvidia's new MX150 GPU.